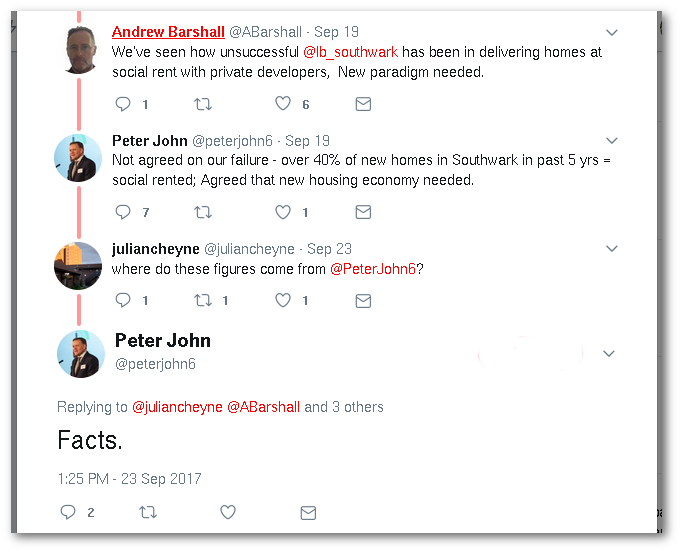 We’re blocked by Councillor John on Twitter, so we couldn’t engage in the conversation or ask Councillor John where he got his ‘Facts’ from. However, we can show that Cllr John’s 40% figure is not grounded in reality. Every year the London Mayor produces an Annual Monitoring Report, showing how many affordable homes are provided in each borough, along with a breakdown of tenures. The report for the current year 2016/17 shows a net gain of just 13 social rented homes over the past three years in Southwark. This is out of a total 5,220 new homes built in the borough over those three years (Table 3.7). That’s an average net gain of just 4 social rented homes per year (if they are social rent; we have shown before how Southwark turns a blind eye to developers and housing associations providing affordable rent instead). The Mayor’s figures are net figures and whilst they don’t take into acccount social rented homes lost through Right to Buy, they do take into account the number of social rented homes demolished. 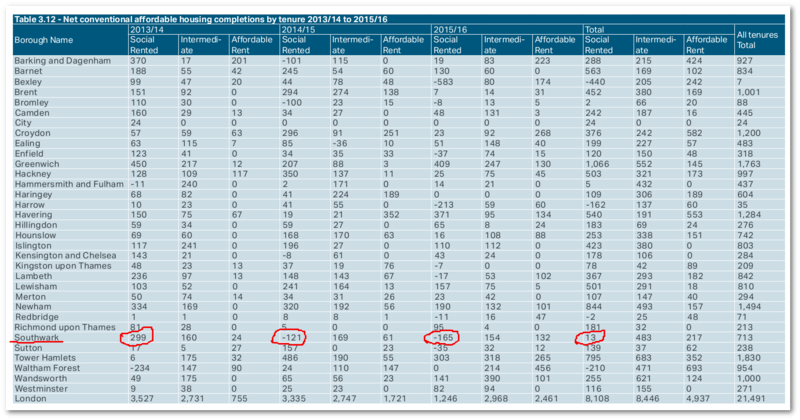 Given Southwark’s ongoing pipeline of estate demolitions it is no surprise that the figures for social rented housing are in some years negative and overall extremely low. 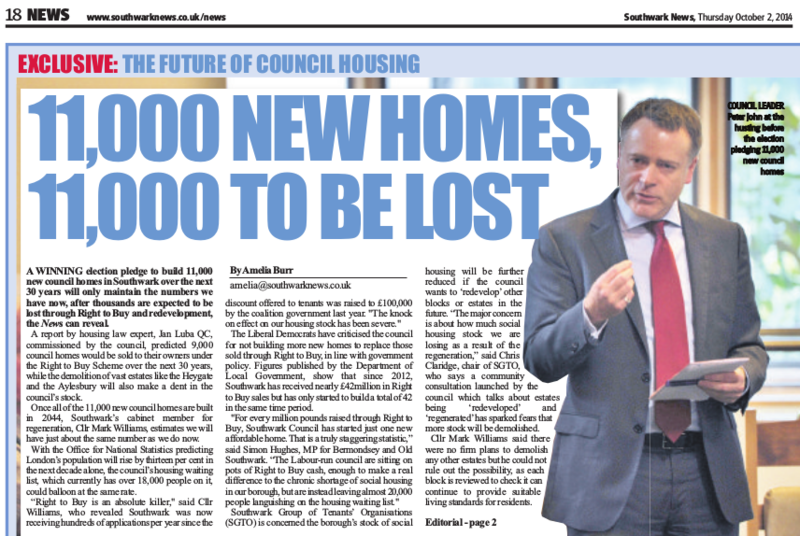 Southwark Council was a bit more candid about its failures earlier in the year when it acknowledged that it had not reached an early phase target for its 11,000 council house building programme. When this programme was announced in 2014, sceptics complained that the plans were nothing but PR spin that would be used to cover up the extent of the growing programme of council estate demolitions. Cllr John responded with an open letter guaranteeing that the 11,000 new council homes would be a net increase to the council’s housing stock. Three years on, the net figures in the Mayor’s Annual Monitoring Reports show just how far Southwark is from achieving this. 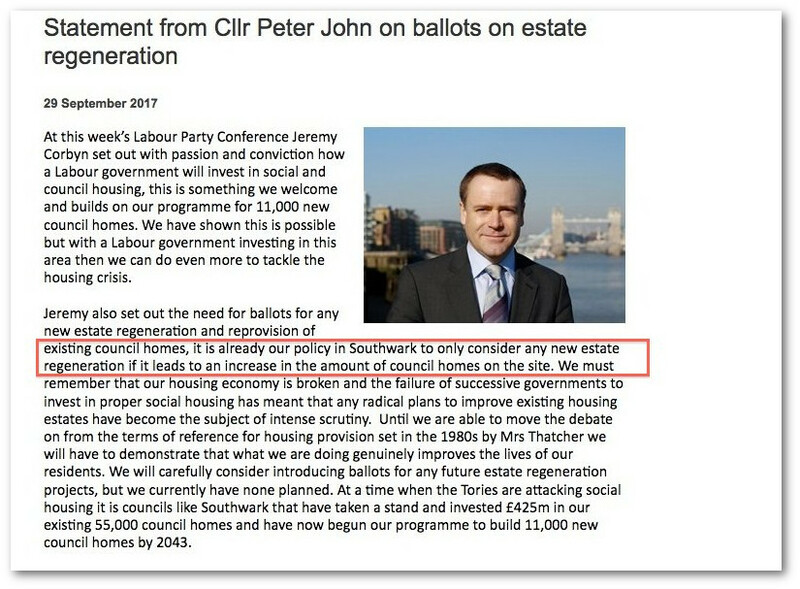 As well as speaking, or at least tweeting, Cllr John wants us to know that Southwark also ‘listens’. 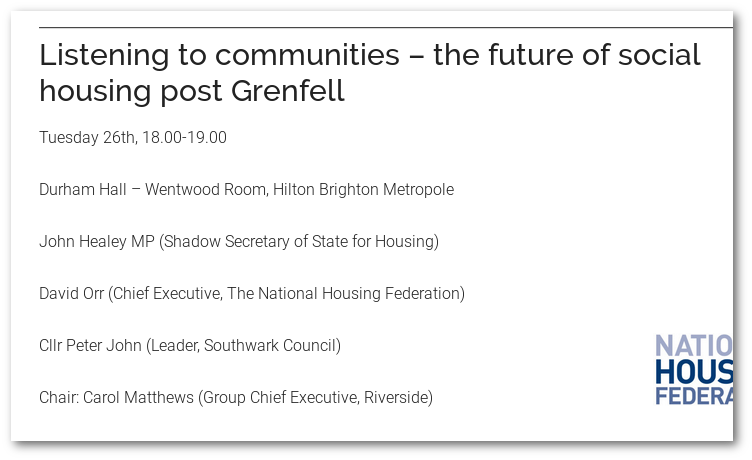 He appeared earlier this week at the Labour party conference, alongside Labour’s shadow Minister for housing John Healey, at a talk entitled ‘Listening to communities - the future of social housing post Grenfell’. All the evidence though, is that Southwark is deaf to its communities, particularly council estate communities. On the Aylesbury estate, 70% of residents balloted voted against its demolition, on a 73% ballot turnout - all to no avail; the estate is being demolished regardless and Southwark continues its ruthless treatment of leaseholders who stand in its way. The Heygate estate community did not even get the chance to be ignored, and were denied a ballot on the future of their homes. 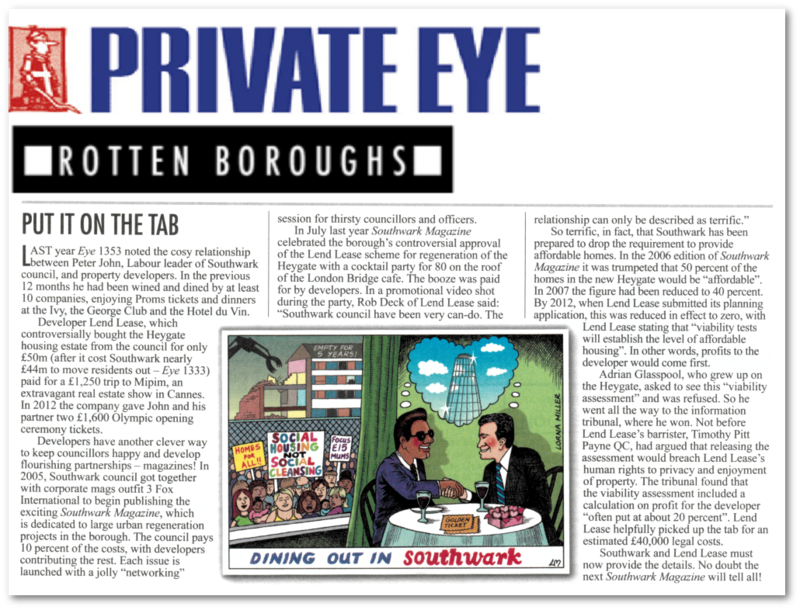 When it comes to developers though, Southwark is all ears; as Private Eye has noted in the past and our growing dossier shows, an increasing number of Southwark Labour members and officials have links to the development industry. If Jeremy Corbyn’s encouraging words that ‘regeneration under a Labour government will be for the benefit of the local people, not private developers, not property speculators’ are to be made something more than a conference sound-bite, then the Labour Party needs to get its house in order and break these ties. Cllr John has issued a press statement in response to Jeremy Corbyn’s speech. He says his Council already only considers estate regeneration where there is a gain in council housing. This is a welcome change of heart, but if it is sincere, Southwark must start by halting the demolition of the Aylesbury estate. This will lose Southwark 2,700 council homes, which combined with the 1,200 already demolished on the Heygate, means that around 10% of Southwark’s council housing stock will be lost. None of this is being replaced by new council housing, but by much smaller amounts of ‘quasi’ social rented housing. The Aylesbury estate regeneration will see a minimum net loss of 778 social rented units, and, notoriously, on the Heygate just 82 of the new homes will be social rented. This can be added to the Elmington estate regeneration, with a net loss of 346 social rented homes and the Wood Dene estate regeneration, with a net loss of 262 social rented homes.